According to reports, the House Oversight Committee is gearing up to subpoena the White House’s former personnel security director regarding questionable security clearances that were allegedly handed out by the Trump administration. Tricia Newbold, an 18-year government employee who oversaw the issuance of clearances for some senior White House aides, says she has a list of 25 officials who were initially denied security clearances but had those denials overruled by senior members of the Trump administration. “According to Ms. Newbold, these individuals had a wide range of serious disqualifying issues involving foreign influence, conflicts of interest, concerning personal conduct, financial problems, drug use and criminal conduct,” a memo released Monday by Rep. Elijah Cummings (D-MD) read. During a hearing this Tuesday, Alexandria Ocasio-Cortez (D-NY) referenced previous news stories on how senior White House adviser and son-in-law to the president, Jared Kushner, used the messaging platform WhatsApp and his personal email account to conduct official government business. Other White House officials allegedly used the app to send messages that contained official government business as well. “Every day that we go on without getting to the bottom of this matter is a day that we are putting hundreds if not potentially thousands of Americans at risk,” Ocasio-Cortez said. “Really, what is next, putting nuclear codes in Instagram DMs?” she added. 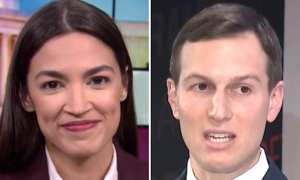 Speaking to CNN after the hearing, AOC said that Kushner and Ivanka Trump should have their security clearances revoked if the allegations are true. “This is completely insecure, and the issue with that as we saw in the lead up to say many attacks and so many issues when we have so many channels of communication anything can get hacked, and if we don’t know what hostile forces know about us, then we are putting thousands of lives at risk,” she said. According to CBS News, Cummings plans to subpoena the deposition of Carl Kline, who served as the White House personnel security director and supervised Newbold. He has since left the White House for the Defense Department.